Watercolour painting produced for Platt of patient with neurofibromatosis of the left leg, 1943. Work has recently begun to catalogue the work of medical artist Dorothy Davison (1890-1984). The collection contains approximately 400 items created by Davison and her students between the 1930s and the 1950s in addition to many more files of rough sketches and working drawings. Davison trained at the Manchester School of Art before going to the Manchester Museum where she produced a number of drawings related to Egyptology, a particular interest of hers. She is however most famous for her medical illustrations which she began after Professor of Anatomy Sir Grafton Elliot Smith saw some of her other work. Davison worked with a great number of different specialities and practitioners producing items for orthopaedic surgeon Sir Harry Platt, Professor of Anatomy G.A.G Mitchell, and obstetrician Daniel Dougal. She worked particularly closely with neurosurgeon Sir Geoffrey Jefferson who was a great exponent of the value of medical illustrations and it is this working relationship which is reflected most in her surviving works. The library also holds a significant collection of Jefferson’s patient case files, a number of which relate directly to Davison’s drawings and the links between the two will be made clear in the completed catalogues. Davison would observe Jefferson in the operating theatre where she would produce preliminary sketches. From these she would create much more detailed works fit for teaching and publication. 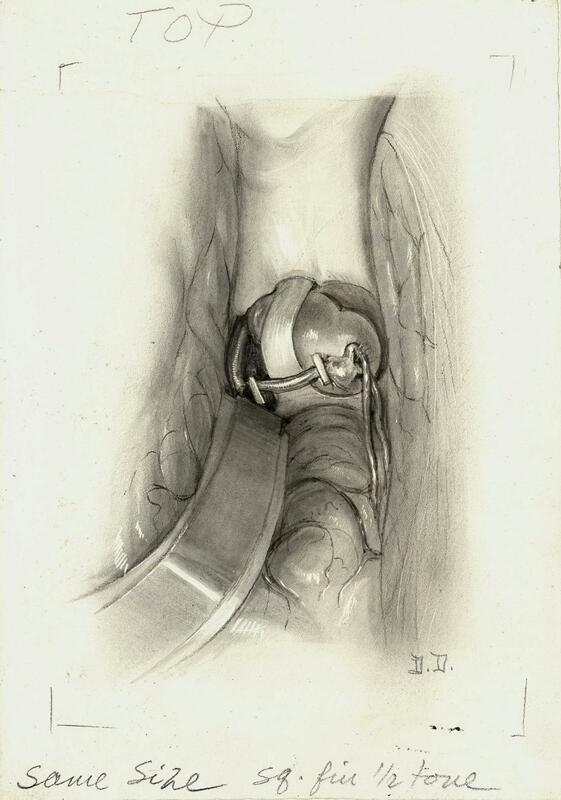 A number of her surviving works still bear comments made by Jefferson offering suggestions and critiquing her drawings to ensure they were anatomically correct and bore an accurate representation of the procedure undertaken. Davison was always keen to stress the importance of a strong relationship between artist and surgeon and her gratitude to them in the assistance they provided, however a cartoon produced by Davison relating to her work with Jefferson suggests that she found his demands and criticisms to be somewhat vexatious at times. Ross board drawing of an operation to clip a cerebral aneurysm, 1952. Analysis of Davison’s works shows her to have used a range of techniques but she was particularly known for being one of the pioneers of the use of the Ross board technique in the UK. The technique, also known as the carbon dust technique, was developed in America by Max Brödel and involves drawing the subject with a carbon pencil onto a white coated stippled board (Ross board) and then building up its three-dimensional form via the application of carbon dust. White paint was often used to create highlights. 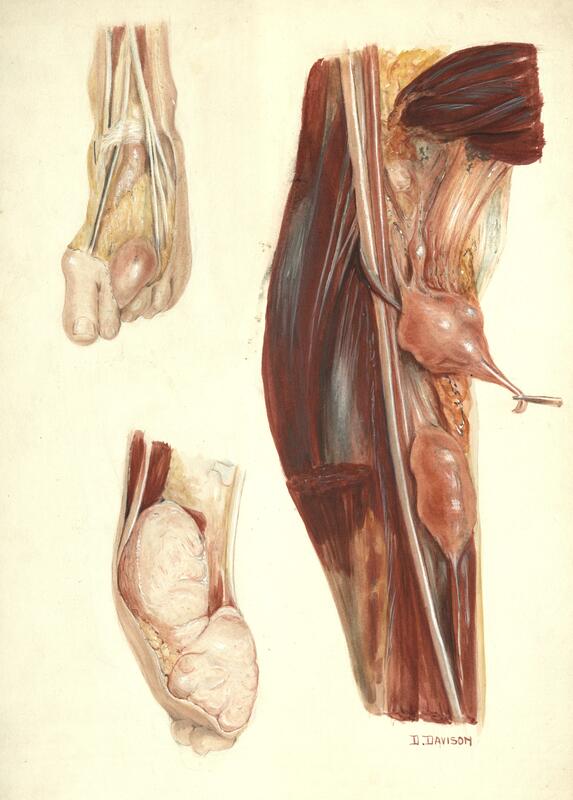 Colour was very rarely used but the detail and depth an artist was able to produce using this technique made it particularly suited to medical illustration. A number of operative and pathological photographs in both the Davison collection and the Jefferson patient files allow a clear comparison to be made between the quality and suitability of the two modes during this period. Davison herself can be quoted as saying that a “medical artist can be particularly useful in elucidating obscure and difficult points, for she never draws the obvious: that is photographed.” (Davison, 1953) The photograph and drawing seen below are of exactly the same procedure performed on a patient in 1949 for the removal of a cholesteatomatous cyst. It is quite likely that Davison used the photograph when producing her final drawing but it is quite clear to see that the drawing allowed for the highlighting of specific details and ultimately a clearer and less confused image. Perry, ‘Forty years of medical art a biography of Dorothy Davison’, Medical & Biological Illustration, 1971, 21(1), pp.27-32.